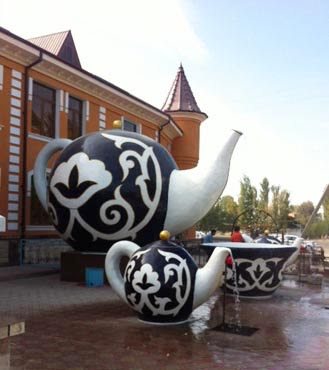 Australian visitors to the Ferghana Valley will be thrilled to see that the tradition of Big Things is alive and well. Australia can boast of the Big Banana, the Big Merino, the Big Prawn, the Big Cheese - there are evidently over 150 Big Monuments in the country. However, the difference between those monuments and this extraordinary Uzbek tea set, is that the latter is in the front courtyard of a private house. It is neither a restaurant nor a tea house, nor is it advertising a product. Driving around last autumn I was astounded to see this three-piece set on the road between Quva and Margilan, in the village of Akbarobod. Thinking that it was a restaurant, I knocked on the door and was warmly greeted by an Uzbek gentleman. During our chat it emerged that he is very proud of the Uzbek tradition of hospitality, of offering guests and strangers a cup of green tea. 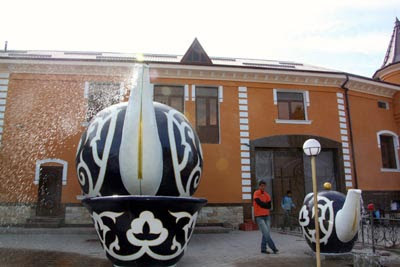 And so he commissioned this tea set for the front courtyard of his new house. The design follows the traditional elements of Uzbek tea sets: dark blue and white and stylised cotton flowers. You will be served countless cups of tea in such cups. And many travellers purchase the cups as small, pretty and evocative souvenirs. The image on the left reveals the scale of this folly. Perhaps if I had not spoken with the householder I would have thought it merely kitsch. Instead I was totally charmed. Update April 2013: I visited Ferghana again and the owner of this extravaganza has now created a small teahouse! The entrance is through the doorway to the left of the teapot in the image.